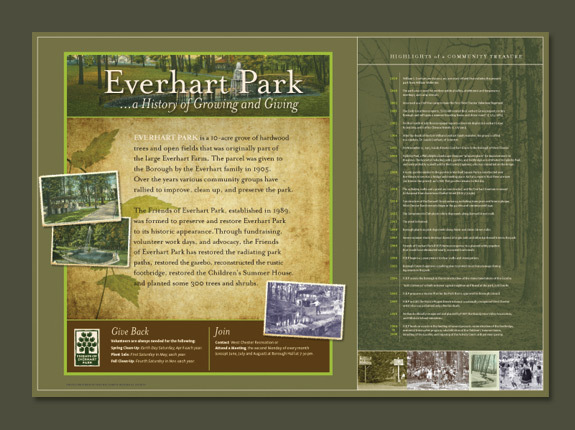 RUN, WALK, PLAY, SWING, CLIMB... PARK YOURSELF at historic Everhart Park in West Chester Pennsylvania. The mission of this lively and dedicated group of citizens is to restore Everhart's Grove to its past glory, while incorporating the new uses it provides and to build-up neighborhood support for and pride in the Park. Established in 1989, FOEP was formed to preserve and restore Everhart Park to its historic appearance. Through fundraising, volunteer work days, and advocacy, Friends of Everhart Park has restored the radiating park paths, the gazebo, reconstructed the rustic footbridge, restored the Children’s Summer House and planted some 300 trees and shrubs.